The construction of the Drogheda Bypass in Co. Meath afforded an archaeological cross-section of the landscape along the eastern fringes of the Brú na Bóinne World Heritage Site. 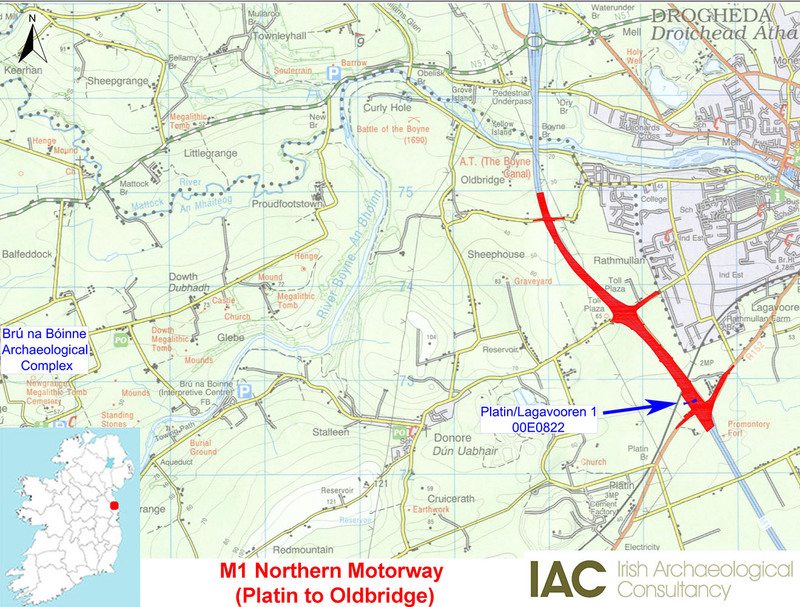 IAC were commissioned to resolve the archaeological sites discovered on one section of this motorway between Platin, to the south, and the River Boyne. A significant archaeological landscape was uncovered, and excavated, here during 2000 and 2001 which included an early Neolithic house; a number of middle and late Neolithic sites (including a timber circle); a substantial assemblages of Beaker pottery; Bronze Age structures and other settlement sites of this period; Iron Age industry and settlement; and an early medieval ringfort. 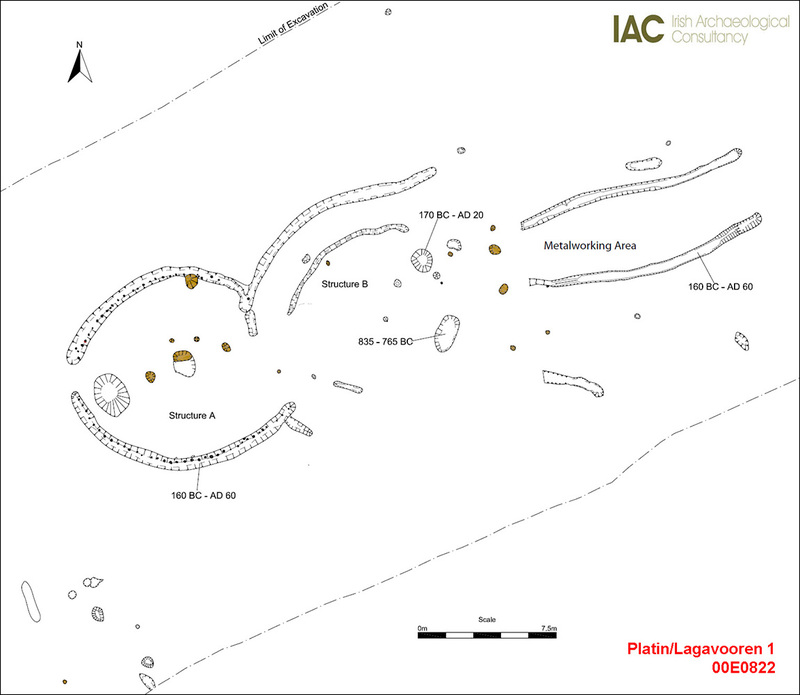 This article relates to the Iron Age site at Platin/Lagavooren 1; the main focus of which was a middle/developed Iron Age structure with associated pits, gullies and metalworking. 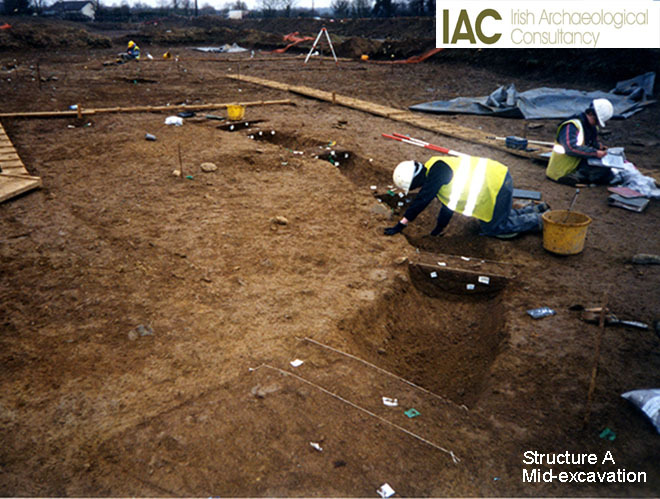 Central to this was Structure A – a well-defined circular building with central posthole and walls constructed of wattle and set within a shallow foundation trench dated to 160 BC–AD 60 (2025±30 BP: dated using blackthorn charcoal). A gap at the western side of this foundation trench suggested an entrance at this point while a larger gap on the east opened out into an area defined by a series of curvilinear gullies (Structure B) which partially enclosed an area of intensive activity comprising groups of pits and postholes. This group includes a pit which returned a date of 170 BC–AD 20 (2055±30 BP: dated using cherry charcoal) and an earlier pit which was dated to 835–765 BC (2620+/-30 BP: dated using animal bone). Structure A and Structure B were conjoined, forming a ‘figure-of-eight’-shaped arrangement. The ‘Iron Age Ireland: Finding an Invisible People’ Project (Becker, O’Neill and Flynn 2008) has recently provided a full appraisal of Irish Iron Age settlement sites and a comprehensive database of all known sites (up to the 2008). 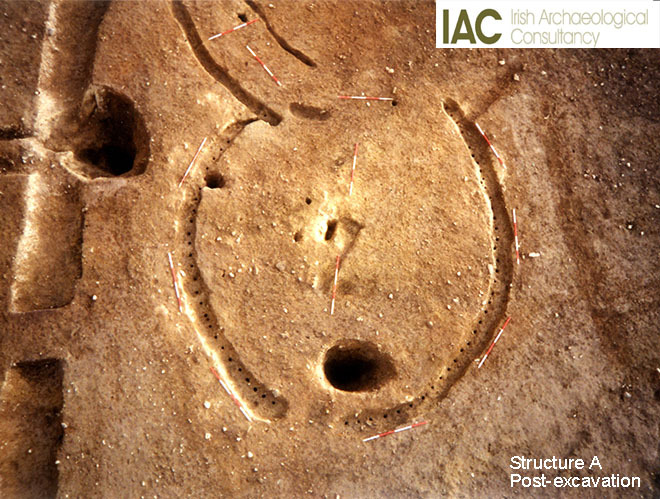 This has established that the majority of Iron Age structures were post-built and circular in plan or a combination of footing trenches and postholes (ibid.). Few, if any, sites identified in this study are similar to Structure A at Platin/Lagavooren, i.e. defined (at least in part) by a foundation trench with stake/postholes along its base. The main Platin/Lagavooren structure (A) would have been a large circular building (11m north–south and 12m east–west) with walls of stake and wattle construction the bases of which were embedded within a curvilinear foundation trench. The central posthole would have housed a large post to support the roof which is likely to have been thatched similar to that at Ballinaspig More, Co. Cork as illustrated by McLaughlin and Conran (2008). The enclosed area defined by Structure B (approx. 11m east–west and 13.5m north–south) may have defined a sheltered ‘working’ area directly accessible from Structure A. This area contained a relatively high concentration of pits and postholes as compared with the rest of the site. Immediately to the east of Structure B were a series of features which contained the bulk of metallurgical waste from Platin/Lagavooren. These long linear features ran parallel and terminated at the same north–south axis at a line of north–south aligned postholes. The majority of the metalworking material was recovered from the fills at the western end of the two main gullies suggesting the focus of metalworking was centred at this location. A group of postholes either formed part of a fence to separate the metalworking from the activities centred on Structure B or part of a superstructure associated with the metalworking activities. It is unlikely that the gullies were ‘rake-out’ gullies associated with any above ground metalworking furnace as they are too large and long. Burnt animal bone from one of these gullies produced a date of 160 BC–AD 60 (2025±30 BP). This is an important site, not only because it adds to the limited corpus of excavated Iron Age settlement sites in Ireland, but also due to the presence of high status metalworking and artefacts. The metalworking is significant as it is of a high quality and included crucibles and ceramic moulds. Of particular interest however was the presence of zinc and lead in the slags and crucibles which is not usual in the pre-Roman Iron Age of Britain and Ireland (analysis and interpretation of the metallurgical waste was by Tim Young). Young suggests a potential Welsh origin for the copper alloys at this site however a Roman origin could also not be ruled out. Among the artefact assemblage—which included fragments of a possible pin shaft; an iron knife; a small bronze ring; a possible iron tool and the shaft of a bone needle or boring tool—were an interesting group of red glass beads. These are also significant as Jackie MacDermott—who analysed the finds—states that they seem (at the time of analysis in 2012) to be the first red glass beads found in a secure Iron Age context in Ireland. Furthermore MacDermott noted that these are not likely to be of native Irish, British or Romano-British manufacture, but may have been imported from Gaul or Germanic Europe through British links. It is clear that the inhabitants of Platin/Lagavooren were in a position to acquire an exotic personal adornment made of a relatively rare material. 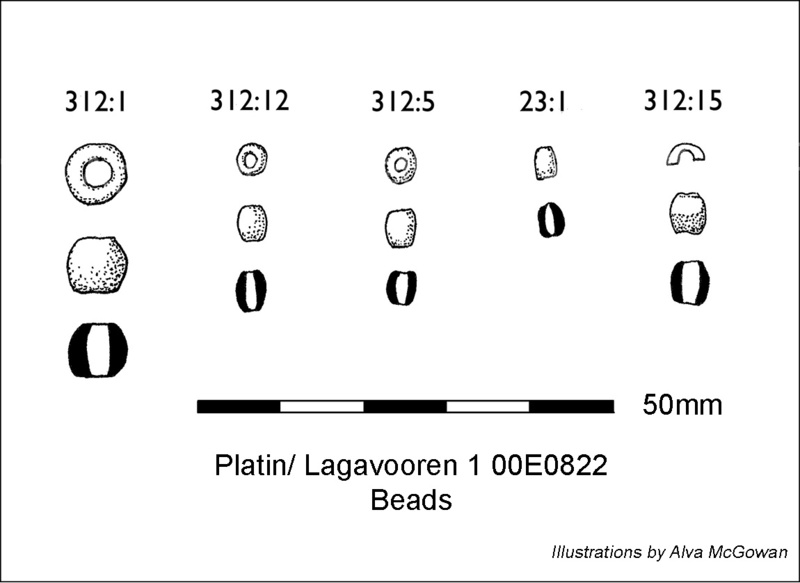 It is in this context that the interpretation of the structures and metalworking at Platin/Lagavooren 1 must be viewed – it was perhaps owned by a well-connected, relatively wealthy Iron Age family who were engaged in high quality metalworking and who also had connections overseas, an idea enforced by the evidence of the beads and their implications for European trade. Becker, K., O’ Neill, J. & O’ Flynn, L. 2008 Iron Age Ireland: Finding an Invisible People. The Heritage Council. McLaughlin, M. and Conran, S. 2008 The emerging Iron Age of South Munster. Seanda 3, 51–53.